To join our mail list for news and previews of new releases, enter your email address below. 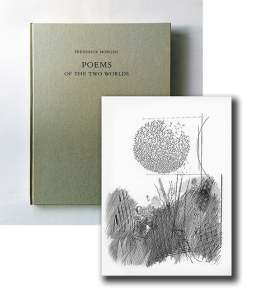 Frederick Morgan, the late poet and editor of the Hudson Review literary quarterly, published an exquisitely produced limited edition of six of his “Poems of the Two Worlds”. With drawings for the poems by Clyde Lynds, this edition of five hundred copies was designed, set and printed by Stamperia Valdonega in Verona on Magnani mould made paper.